Knowsley’s only Grade I listed building, the Church of St Mary the Blessed Virgin dominates the Prescot skyline with its 18th-century spire. The bell tower offers stunning views for miles around. The building itself goes back even further than the tower, dating to 1610, in the Jacobean era. 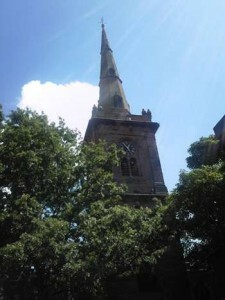 It is still the centre of worship for a thriving Church of England parish, and is often open to visitors for special occasions, such as the the Elizabethan Fayre (early June), the Prescot Festival of Music & the Arts (late June) and Heritage Open Days weekend (early September). See http://prescotchurch.merseyworld.com/index.html for more information.